Text 1 — Enter an optional, user-defined value that is routed to the exchange for clearing and back office purposes. Maps to Tag 25007. Enter up to 12 alpha-numeric characters, special characters are allowed. Text 3 (Clearing Account Override) — The exchange-provided account number in this field is routed to the exchange instead of the user's primary parent/sub-account for order routing and clearing. 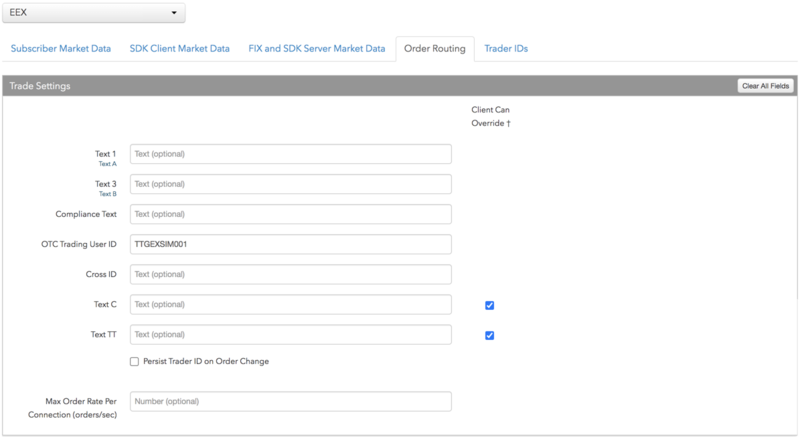 For example, users can share an order book when they share a membership, but have their own unique clearing account that updates when they modify an order. Maps to Tag 25009. Enter an EEX account number up to 12 characters. This field is optional. When blank, the user's account name is sent to the exchange in Tag 25009. OTC Trading User ID — Enter the exchange-provided User ID for submitting Block and OTC orders (e.g., ABCEXTST001). This field is required for submitting Block or OTC orders. The OTC Trading User ID is made up of the exchange-provided member ID (e.g., ABCEX) and trader ID (e.g., TST001). Because the user's member ID is also used for creating the FIXML OTC connection, the user can only submit OTC orders using the FIXML OTC connection for their membership. Cross ID — Enter the user's self matching prevention (SMP) ID provided by the exchange. The SMP ID prevents the user from cross matches and its use is optional. The exchange's self matching prevention functionality applies to all natively supported order types and mass quoting, but does not apply to auctions or synthetic matching. TextTT — Enter an optional, user-defined value that is included on submitted orders, but is not routed to the exchange. This value remains on the order in the TT system and can be used for tracking purposes. Enter up to 12 alpha-numeric characters, special characters are allowed. Trader IDs are added by configuring the User ID Override setting on the More | Trader IDs tab. You can also select Add New from the trader ID selector when clicking an ID entry in the table. Trader IDs that are user-defined for EEX must be configured using the Trader Ids tab. If you add a trader ID value, it overrides the exchange-provided trader ID (UserId) on the exchange connection for all orders sent to the exchange. For EEX, the trader ID is not restricted to a single connection. A user-defined trader ID can be up to 11 characters. UserIds can be shared (i.e., configured at the session level) for EEX Derivatives sessions. To override this per user, click the trader ID for the connection in the Trader ID table and add a user-defined trader ID. An EEX Derivatives connection only appears in the grid if the account assigned to the connection is also assigned to the user. Note: If a UserId is not configured for the EEX Derivatives connection, then each user assigned to the connection must have a Trader ID assigned. Individual trader IDs are also mapped to Tag 50. EEX requires Tag 50 on all order actions. For an EEX Spot Emissions connection, UserIds cannot be shared (i.e., configured at the session level), so you need to configure the UserID in the Trader ID grid. The exchange-generated UserId (Trader ID) is used to select the correct session (connection) for Spot Emissions orders. Note: An exchange-generated UserId is required for each end user who is configured to trade on an EEX Spot Emissions connection. The UserId is configured via the override option on the User | Exchanges | EEX | Trader Ids grid on TT. Again, an EEX Spot Emissions connection only appears in the grid if the account assigned to the connection is also assigned to the user.